Enjoy interacting with people and develop your communication skills at special events on the Zoo site, such as Boo at the Zoo and Adopt-a-Pond Toad Festival. 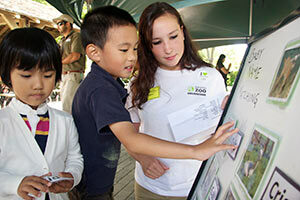 Utilize your expertise working with children at our summer Zoo Kids day camp. Commitment of at least 20 hours per year. Volunteers do not have any direct contact with the Zoo's plants or animals. Applications due annually, on the first Friday of January. Qualified applicants will be contacted for an interview after this date. Recruitment for the 2019 Zoo Ambassador Student Volunteer program is now closed.